Instagram Stories has been around since August 7, 2016 and has since then become a hot discussion topic and feature for many Instagrammers. 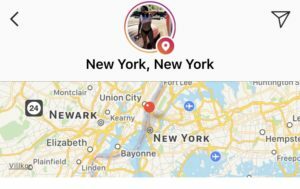 The new feature which was instantly accused of being a rip-off from Snapchat’s very own stories quickly gained traction because of all the already existing users Instagram had. 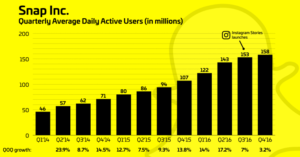 Even so that Snapchat’s growth slowed 82% after the launch of Instagram stories. In came the biggest “shock” that was seen as a punch in the face from Instagram to Snaphchat. In October 2016, Instagram hit 200 million daily active users, surpassing the last count of 161 million that Snapchat announced alongside its IPO. Instagram launched Stories in August, two months later hit 100 million daily users, and in January reached 150 million daily users, surpassing Snapchat. With the fact that over 150 million Instagrammers are using Stories daily, we can draw the conclusion that is must be able to use Stories to reach those individuals and by doing so growing your Instagram account. Stories is a great tool for growing your account because it allows you to go more in-depth and be more personal. On your Instagram feed, you only want the best of the best content, but as your Instagram Stories vanish after 24 hours, you don’t need to focus on sharing high-quality content every single time. On Stories, it’s more about sharing interesting content. However, as Stories is relatively young, not many people have implemented it into their social media content strategy even though it can generate some fairly good results. In this article, we’ll, therefore, provide you with the top tips on How To Grow Your Instagram Using Stories. Content is half the battle on Stories. As more people are using Stories, you need to have a strong and unique content strategy to stand out from the crowd and attract new audiences. If you’re a regular Instagram user (which you should be), you may or may know about the huge exposure you get by ending up on the Search and Explore page on Instagram. If you’re new to the S&E page, it is a page on Instagram which displays content that you might like, based on things you’ve engaged with previously. So by ending up on the Explore page, you’ll get a ton of exposure and ultimately followers. 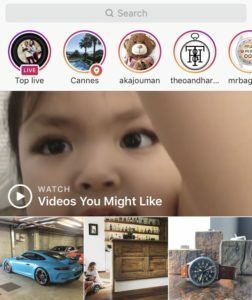 This was only possible with “regular” posted content previously, but as of 2016, Instagram added recommended stories from accounts relevant to you on the Search & Explore tab, giving you a new way to end up on the Explore page – with your stories. As you can imagine, getting your content displayed on the Explore page is not as easy as it might seem, but the good news is that you can optimize your content to increase the chances of ending up there. When sharing content on Stories, you don’t have to be afraid of posting something that doesn’t hold the quality your Instagram posts does. Stories hold a much lower quality standard than regular posts, and that’s because the quality is not the main purpose. It is to bring your followers behind the scenes and take them on a personal journey. As a business, using the same principle as you should when making regular content is to recommend. That is to mix fun content with some promotional content. This is the single best method of dramatically increasing your reach and ultimately followers. A while after Instagram launched Stories, they also launched Stickers, and then finally hashtags and location stickers, which were more useful than fun. 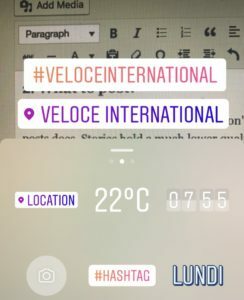 The location sticker lets you search for a location in the search bar, and see Stories which has been posting using that particular location with the sticker. The same goes with the hashtag sticker. When searching for a hashtag, you’ll also be able to see stories that have been made using that particular hashtag. As you can imagine, the visibility of your Story increases dramatically by getting your Story on a crowded location or hashtag. This makes it possible for anyone to find your Story and account! Therefore, make sure you’re always using location and hashtag in your Story because you might just end up on the Explore page. You don’t want to go sharing videos and photos of everything you see on your Story. Instead, you want to decide on a few things that you want to share on your Stories. It might be to film your co-workers in your workspace or give sneak-peeks of new products. But whatever you do, make sure you aren’t losing the red thread in your Stories. People love to see real people and faces in Stories. In fact, studies have shown that photos including at least one face generate a 35 percent like increase, and this means an increased interest in your Stories as well. So when creating a Stories strategy, make sure you are including at least some faces into it. Bright posts on Instagram have shown to get a better engagement than posts and interest that are darker and dimmer. So use bright vibrant colors and create stories with a lot of light. If you want to further draw attention to your stories, you can use the paint color pallet to paint on your Story. Results won’t show over just one week, heck, you won’t even notice too big results over two weeks, but over a longer period of time, you will. Bu posting regularly, you’re also making people more aware of when you post Stories, which might make them visit Instagram to see them. It is recommended to post at least once a day on Stories, so you make sure you are the one who’s on top of everyone’s mind and don’t get forgotten.